I used a turquoise and white floral print cotton and some vintage white lace with a heart design for the shorts, pattern cut from the trouser block. I used Ann Hagar this time, as I hadn’t used a block form her book yet. It was interesting… I have drafted so many trouser blocks from Winnifred Aldrich, and Ms Hagar does hers so completely differently! The top is drafted from the close-fitting bodice block, fullness added at the centre front and back and darts left un-sewn, naturally. The fabric is white cotton poplin, again with the vintage lace. To identify the fronts and back, I sewed on a small length of white ribbon to the front of the shorts to tie in a little bow. 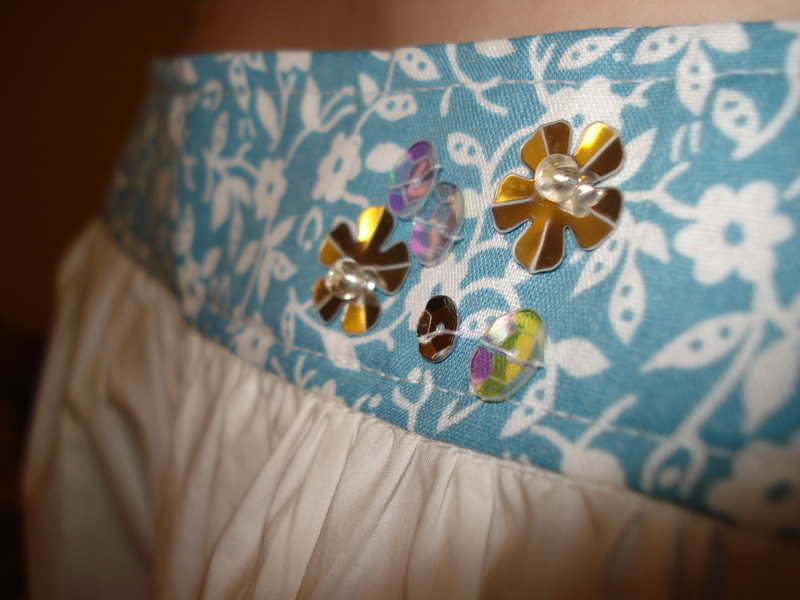 The top has a grouping of sequins and beads. Daughter no 2 is presently re-re-re-reading the Twilight series, and is halfway through Breaking Dawn. The whole series has been very popular with her and her sister. The shorts are made from a black, white and red cotton print left over from lining a handbag… The black lace with little circles matched the print quite nicely, and is also from my stash, and is a piece of vintage stuff I got from the Ironbridge Victorian Village a few years ago. Leave it to me to find the teeny tiny sewing shop!! Daughter isn’t reading fiction at the moment. It’s crunch time for finishing A-level coursework and projects, so her reading material is for her Art coursework and her Extended Project Qualification. And me…. 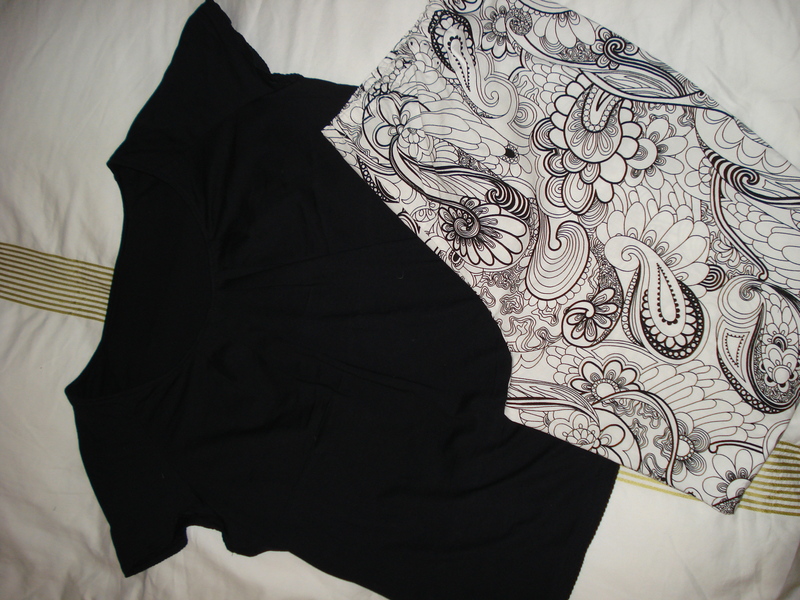 I used a black and white paisley print cotton I liberated from a student at a fabric swap we had at our Sewing Sunday at the beginning of April for the trousers, and black cotton jersey for the top. I haven’t added any lace or other trims. The trousers were adapted from the trouser block from Winnie Aldrich, but for the top I had to use a Burda pattern. Just not enough time! I used Style no 113/4 from Burda 12/2008. 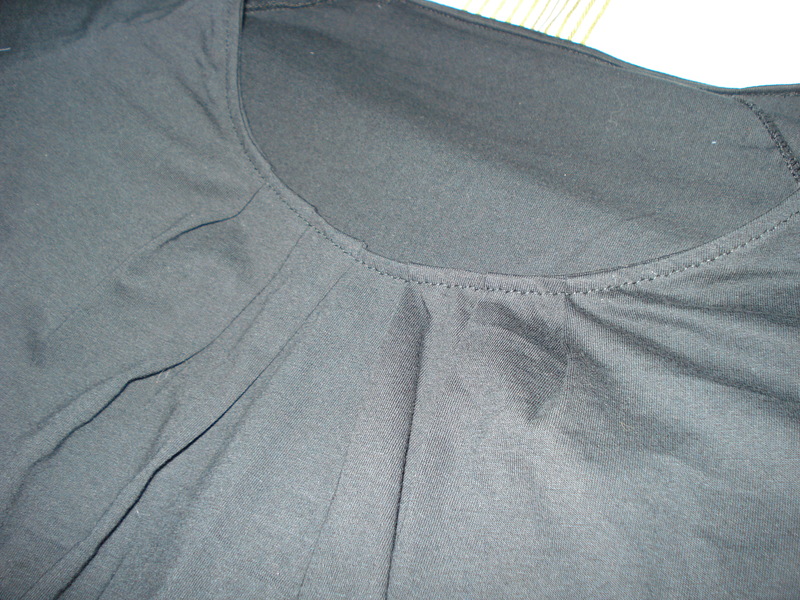 The top has pleats on the curved front neckline and raglan sleeves. 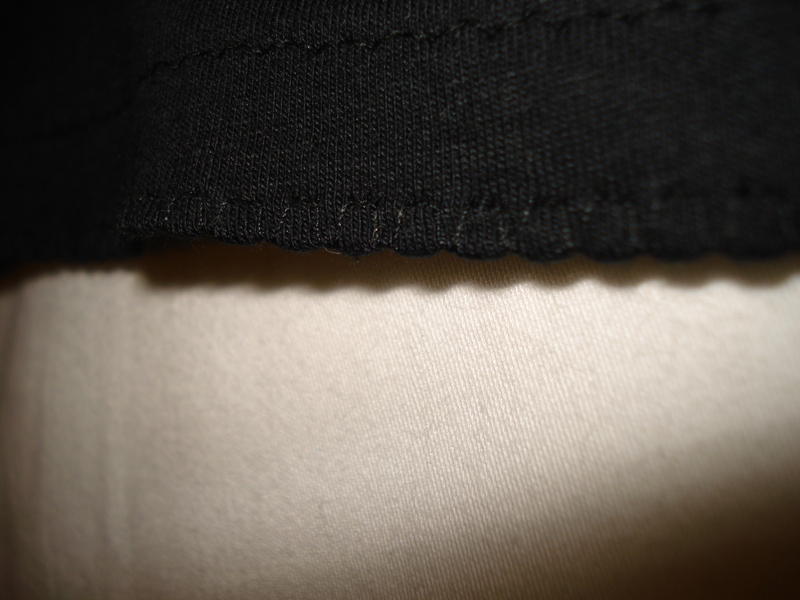 Because I had no trim I used the overlock stitch on my sewing machine to make a little “picot” edge on all the jersey hems. Pleats on the top. It's so hard to capture detail on black jersey! The pleats on the top make it really comfortable, and not too full. 10/10! Thanks Burda! 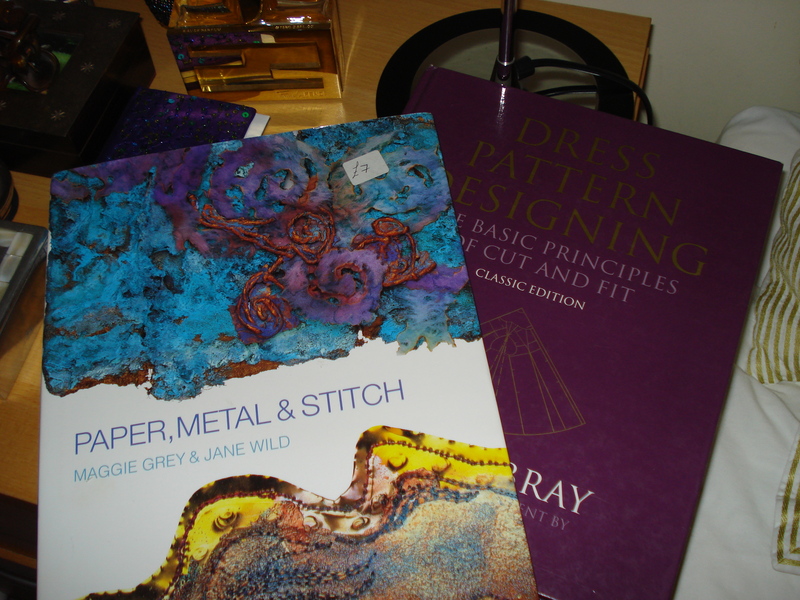 My reading list is Natalie Bray’s “More Dress Pattern Designing” and “Paper, Metal & Stitch” by Maggie Grey & Jane Wild. I picked it up for just £7 at a 2nd hand booksale. 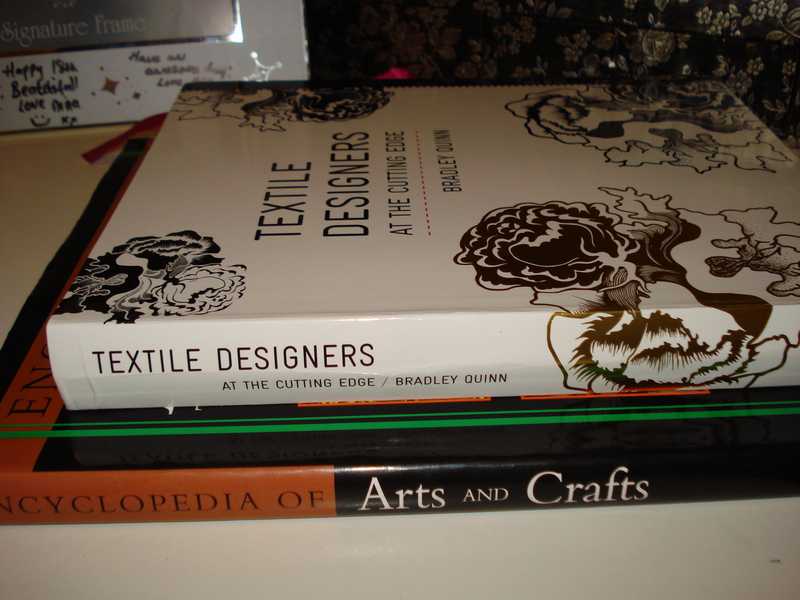 Natalie Bray is on the list because I want a new jacket pattern and I fancy a Kimono sleeve. She has the best instructions! Paper, Metal & Stitch is just to get some creative juices flowing.. I never have any time to actually play with this stuff! Hope you all have a fabulous pyjama party, and thanks to Karen for being such a great hostess!! Whoo! A pyjama hat trick- I’m very impressed and inspired! thats 2 lovely pjs. Your daughters are really cute ! Wow 3 pj sets!! All so pretty too! These are awesome! Great job on the drafting. I like the red ones best. Love the PJs and your book collection looks so interesting. It’s really heart-warming to see that daughters don’t grow out of wanting their mums to make them stuff. Best wishes for the A levels! All the PJs look lovely and the reading material looks so interesting. It’s heart-warming to see that daughters don’t grow out of wanting their mums to make them stuff. Best wishes for the A levels!! Aaah, no, my two are constantly adding to my pile. Daughter no1’s best trick is to ask for something the day or better still – the morning before…. Bravo for finishing three sets of pajamas – and all with beautiful details at that! Your family will be the center of attention at the party! Great PJs. All so nice I can’t pick a favorite! those are all so cute–but i LOVE the red white and black shorts! super cute! I also like the black and white paisley fabric for your pants. how fun to make all those pjs! thanks for the inspiration! Thanks! I have more paisley print, I had intended to make a short Kimono “gown”, but ran out of time for this challenge. I may have it done for me-made-may. A whole family of pajamas! The little sequins are a cute touch. We all need a little sparkle in our lives, don’t you think? Wowzer, great job making so many pairs of PJ’s! You’re a sewing superstar!! Your daughters are adorable, and their pajama sets are so cute! I really like the pleated neckline on your top, too. Great job! Previous Previous post: More goodness in the post!